The center of Torino is 18 Km from our B&B. In a green and residential area, we are the first village of the Mountain Community Valsangone, 350 mt. above see level. Strategic position to reach mountains. at the entrance of Val di Susa with its wonderful lakes. “Sacra San Michele” the Abbey r is a few Km from us, looking at mount Pirchiriano and with a wonderful sight of lakes and Natural Park below. Along the walk to the mountains, you can visit some small vineyards with selected exquisite handicraft products. 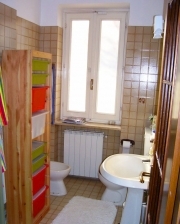 We have 3 double bedrooms with private bath. Extra beds and creedless available. Color TV, frigobar, kettle in all rooms. Free Wi-Fi internet access. The house has an outside open gallery and a lawn for breakfast, a spacious room for meetings, where to taste a nice drink, a liquor and even a hot chocolate. Breakfast is served inside or outside, according with seasons and with guests wishes. We have an outside reserved area for your pets.